The choice of material for the roof takes into account the individual characteristics of the building: the angle of the roof, the solidity of the foundation, the general architectural style. When choosing a topcoat, sheet metal is often preferred. 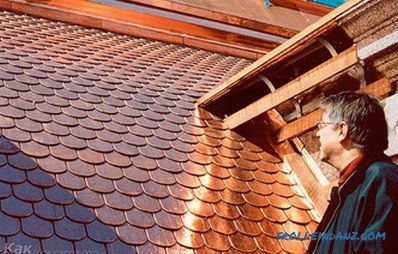 This material ensures the durability of the roof, has a small weight and does not weigh down the structure, processing and installation of metal is not difficult, which speeds up the whole process of building the roof. In this article we will look at how to cover the roof with iron. What type of roofing iron to choose? 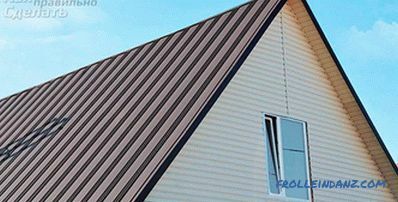 Metal sheets, intended for roofing work, differ in appearance and coating. 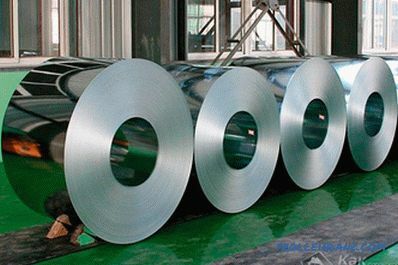 Ferrous iron - sheets or rolled steel uncoated, resistant to mechanical stress, but does not tolerate moisture. This is a budget material, but for long-term operation needs anti-corrosion coating. 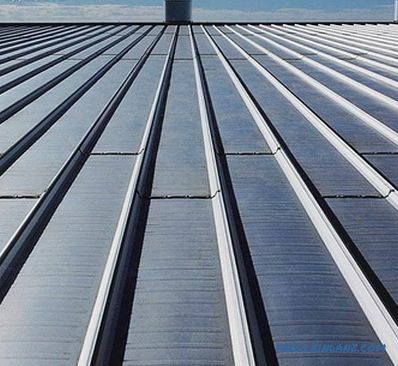 Galvanized steel - has a smooth surface , resistant to atmospheric precipitation due to a protective layer of zinc, indispensable when constructing a folded roof. Profiled metal - galvanized iron, profiled to create stiffeners. Has a trapezoid, undulating or rectangular cross-section. After treatment with a polymer coating, the anti-corrosion and aesthetic properties of the material increase significantly. Before you cover the roof with iron, you need to make a solid crate, which eliminates metal deflections. 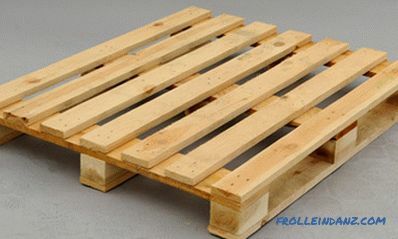 The basis for the iron sheets are wooden bars, located 20 cm apart, a continuous crate of cut boards or a step-by-step crate of boards nailed 10 cm away. a mixture of drying oil and red lead. 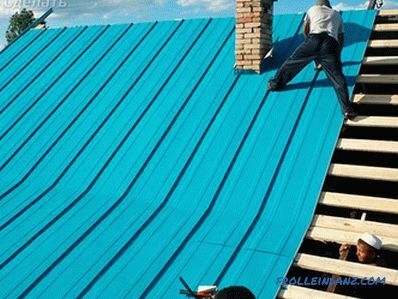 Iron sheets are primed with a mixture of drying oil and red lead before starting work, in order to increase the corrosion resistance. Dried iron is cut into pieces of the desired size, for this purpose, metal shears are used (the Bulgarian is strictly prohibited). The faltsevy way reliably protects joints from course. It is a combination of adjacent sheets of iron in the lock, made by bending the edge. 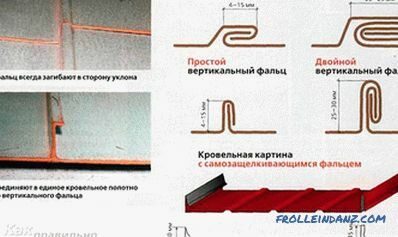 For horizontal connection, folding folds are made. They are made using special machines or on benches using a hammer and a mallet. At the edge of the sheet, they draw a line and bend the edge with a mallet, for this work you will need a workbench with a metal corner. On another sheet, the edge is folded several times, before creating the U-shape. The junction is sealed and bent close to the metal sheet. 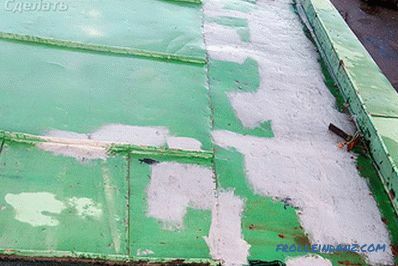 In this way, blanks for laying on the roof are formed; they are called paintings. On the roof, all the paintings are connected with the help of longitudinal standing folds. In their manufacture using combbib. Before you start mounting checked the location of the sheets in the vertical plane. 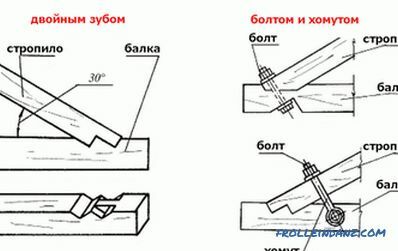 The length of the workpiece is recommended to be equal to the size of the roof slope. The paintings are laid in rows from the ridge to the chute. For consolidation of lying seams the steel strip is used. In places requiring special strength of seams, double fold is used. It is made by bending the edges of two sheets, followed by simultaneous folding. The recumbent fold is established by a bend to the eaves, this allows water to flow freely along the roof. The paintings are fastened to the crate with metal clips. The most difficult step is the design of the collar for the chimney tube. It is made in advance, according to the shape and dimensions of the pipe. With metal sheets the collar is connected by standing seams. In order to understand how to properly install the roof using a folded joint, it is worth watching a video with professional recommendations. 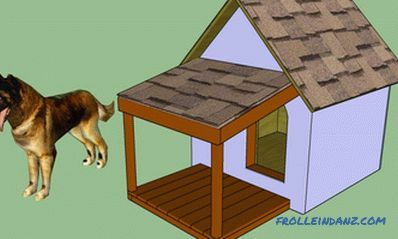 When deciding on the size of a gofrolist, choose an equal slope along the roof, if it is large, be guided by the convenience of transportation. 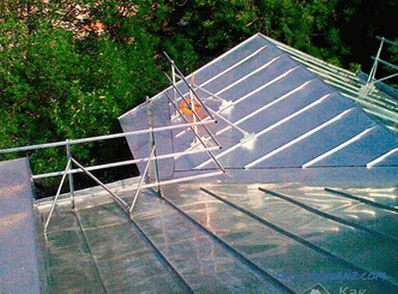 When counting the number of sheets, consider the angle of inclination of the roof, if it is within 15 to 30 degrees, an overlap of up to 20 cm will be required. 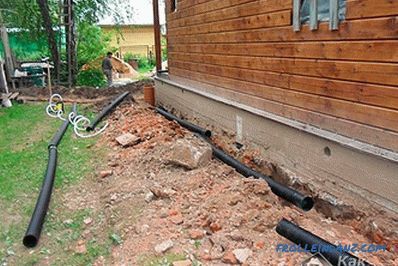 A waterproofing film should be laid before installation of a professional flooring. It is fastened with brackets to the rafters. On top of it, counter rails are installed, providing clearance with metal sheets. 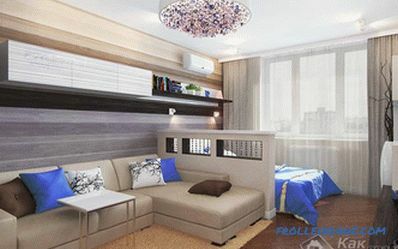 The polymer coating of professional sheets should not be damaged during transportation and installation, this will lead to the loss of anti-corrosion properties of the material. N - used for a capital roof, it is distinguished by additional stiffening ribs. Professional sheets are easy amenable to processing, for stacking and fixing you will need a hacksaw and a screwdriver. Lay the sheets from the bottom up, starting from the right end. 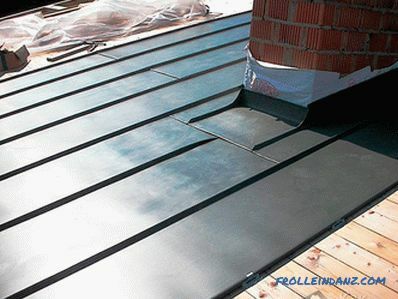 Solid profiled sheets are pre-fixed with a single screw and laid along the entire length of the roof. 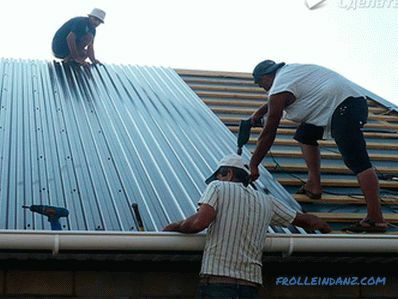 After aligning on the rail, the final fastening is carried out with roofing screws, the heads of which are selected according to the color of the polymer coating. Horizontally, they are screwed with a screwdriver into every other wave, vertically at the distance of the crate. The upper and lower parts are fixed with a screw into each profile. 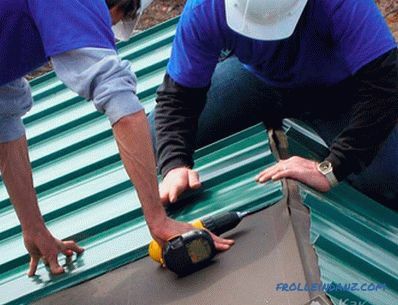 When using several rows of corrugated sheeting, their transverse joints are connected with an overlap of at least 20 cm and coated with silicone sealant. When working, with profiled iron, care should be taken to avoid damage during movement. It is recommended to wear soft shoes or make wooden flooring on the finished section of the roof. A properly installed iron roof will provide reliable protection for many years, this is good the coating will withstand rain and wind. 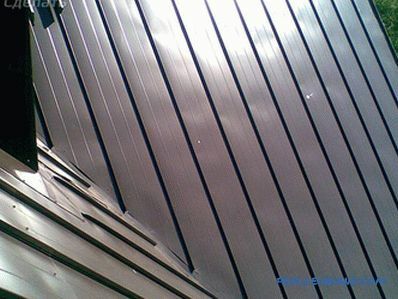 The shiny or colored surface used by the metal sheets will complement the architecture of the building.